Orbital Express Truss Displays are emerging as the #1 choice for jaw dropping trade show exhibit booths. When it comes to Orbital Truss systems tradeshow-stuff has you covered. 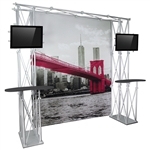 Choose from over 60 different truss displays plus graphics and accessories.